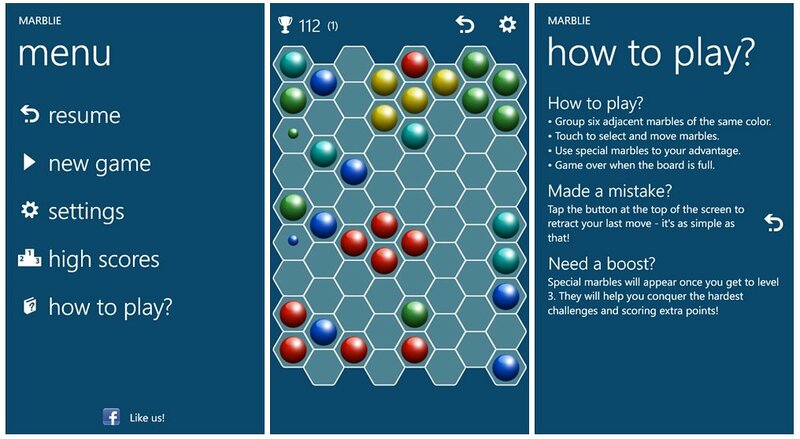 Marblie: Marbles Reinvented is fairly simple, yet challenging Windows Phone puzzle game. Marblie has you moving marbles around the game board to match six marbles of the same color in adjacent tiles. Marblie is a nice puzzle game with a casual pace. While it may lack a lot of bells and whistles, the game is challenging enough to keep things interesting. Overall, Marblie: Marbles Reinvented isn't a bad way to pass the time. The main menu for Marblie has options to play the game, access the settings, view the leaderboard and view the help section. Settings cover sound/music on or off and your screen name for the online leaderboard. The game screen has your playing board which is composed of hexagonal tiles and a spattering of marbles. 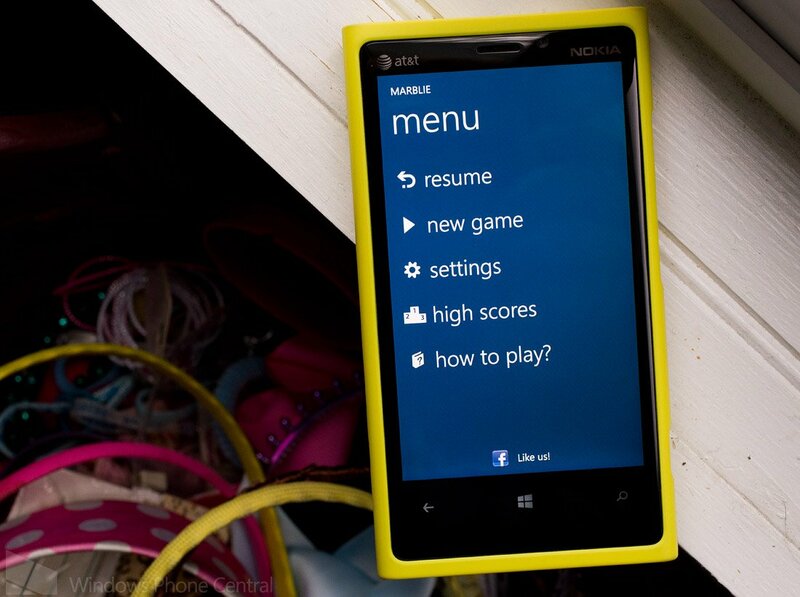 Up top is your current score, your current level, an undo button and a settings button. Game play is simple. Tap on a colored marble to select it and then tap on a destination tile. Marbles can be moved anywhere on the game board that isn't occupied by a marble or where the path to the tile isn't blocked by marbles. You move marbles into a cluster of six of the same color to have them removed from play and to collect points. If your move doesn't result in a cluster of six, additional marbles are generated on the board. It takes two moves for these marbles to become fully grown and while they are small, you can relocate a marble to that tile. Eventually, all the tiles will be populated with marbles, leaving you with no moves to make, ending the game. There are bonus marbles that appear once you get past level three that act as chameleons, matching any marble cluster that it is adjacent to. Marblie: Marbles Reinvented may not be an action packed puzzle game but that's not necessarily a bad thing. I think the music could use a little work but for a casual game, Marblie isn't a bad choice. 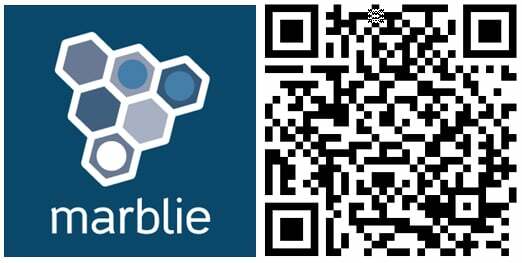 Marblie: Marbles Reinvented is a free, ad supported game that you can find here in the Windows Phone Store.